Another album from 2001 that really worked for me during a time of hudge drama. 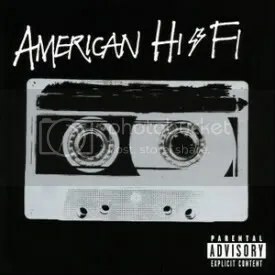 American Hi-Fi are a blend of alternative, power pop and pop punk (which was an extremely popular genre in the early 00s). I’ve never really cared for pop punk, but I was heavily into modern day power pop at the time with bands like Tsar, 40 Ft. Ringo, Lit, Zebrahead, Weezer and of course, one my favorite bands of all time Marvelous 3. American Hi-Fi came along went a sound that was slick and not too slick. The album has more of an alternative rock edge than the previously mentioned bands’ work and it’s not quite as cheery and carefree. I spent a lot of time sitting on the bed with my headphones on, using a DISCMAN, in my friend’s house in Virginia (where I stayed while going to college for a semester) listening to the melancholy/aggressive songs like “Safer on the Outside”, “My Only Enemy” (which, with a little more sprucing up, could be a NIN song) and “Don’t Wait for the Sun”. I got a lot of poetry done being inspired by the music and the word of Stacy Jones. “Flavor of the Weak” hit #5 on Billboard’s Modern Rock charts, but it’s a shame the album wasn’t more successful, it’s definitely a worthwhile rock/pop entry for the early 2000s. The band has been in limbo for a few years after The Art of Losing (2003) and Hearts on Parade (2005, and produced by Butch Walker!) were commercial failures. Supposedly, a new album, which was initially planned for 2008, is still on the horizon. In the meantime, Jones has gone on to produce a number of albums and is the “music director” for Hannah Montana/Miley Cyrus and is also her touring drummer.